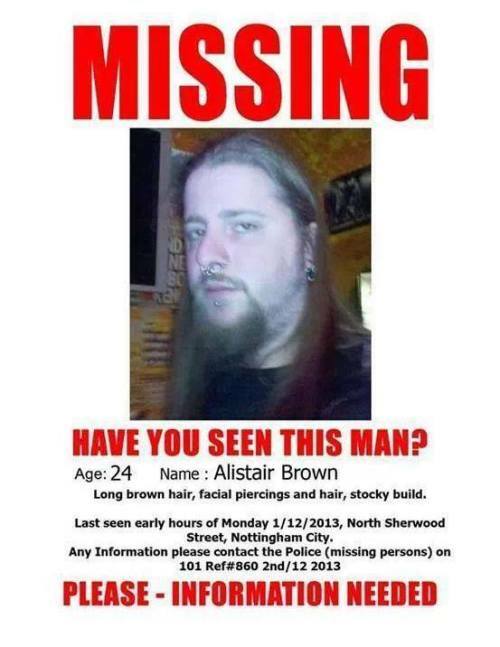 Earlier this week, in the early hours of Monday morning (2nd December 2013), the landlord of a rock and metal pub in Nottingham was reported missing. Alastair Brown, aged 24, who runs the Hole in the Wall pub, in North Sherwood Street, was last seen at around 5am on Monday morning. Alastair, also known as Al, is described as tall, with a stocky build, long brown hair, a beard and facial piercings. His friends have described his disappearance as completely out of character and a missing person’s poster has been shared on social media sites Facebook and Twitter. The police said a man had been reported missing and they were investigating. Over the years Al has supported many of the Rock scenes pubs and events within the Nottingham area, he’s also worked hard behind the scenes at the Bloodstock Festival. If anyone does have information relating to Alastair’s disappearance, please contact Nottingham Police immediately (Tel: 101 with REF #860 02/12/13) or message the Facebook group at this location. This entry was posted on 5th December 2013 at 2:31 pm and is filed under News with tags Alastair Brown, England, Facebook, Heavy Metal, Hole in the Wall pub, Nottingham, Nottinghamshire, Pub, Rock, Twitter. You can follow any responses to this entry through the RSS 2.0 feed. You can leave a response, or trackback from your own site.